King mackerel has reddish meat that turns off white when cooked. The skin is silver in color and has no scales. The meat is not oily and has very fine flakes when cooked. King mackerel only has bones on the sides and center both of which are easy to remove. 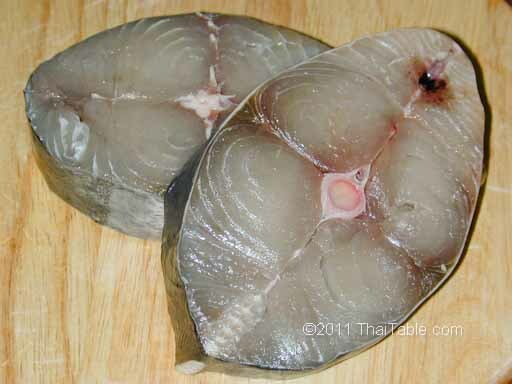 In Thailand, king mackerel is salted whole and sold as steaks. The salted king mackerel can be pan fried. Fresh ones can be pan fried too. Both fresh and salted king mackerel are available here in the US at most Asian grocers. You can sometimes find salted king mackerel steaks in the freezer section.